Home > Books > Bee-Bim Bop! Bee-bim bop ("mix-mix rice") is a traditional Korean dish. 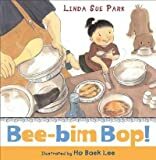 In bouncy rhyming text, a hungry child tells of helping her mother make bee-bim bop: shopping, preparing ingredients, setting the table, and sitting down to enjoy a favorite meal. The enthusiasm of the narrartor is conveyed in the whimsical illustrations, which bring details from the artist's childhood in Korea to his depiction of a modern Korean-American family. The book includes Linda Sue's own bee-bim bop recipe! About Ho Baek Lee (Illustrator) : Ho Baek Lee is a published author and an illustrator of children's books. Published credits of Ho Baek Lee include Bee-Bim Bop!, While We Were Out (Bccb Blue Ribbon Picture Book Awards (Awards)).